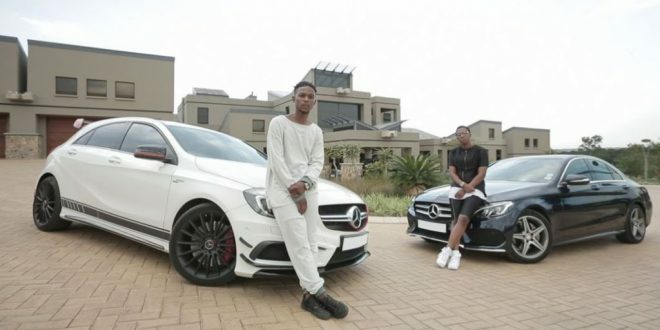 Durban’s youngest “millionaire” Jabulani Ngcobo has no qualms about being investigated by the police and the SA Reserve Bank – and he has branded his critics racists and vowed to splurge more millions to promote his business. The Police Commercial Crimes Unit and the Reserve Bank confirmed this week that they had begun investigations into Ngcobo’s wealth. “We have a police inquiry against him, but it’s not a case docket yet,” said an SAPS Commercial Crimes Unit officer who asked not to be named. Ngcobo, 26, made headlines after throwing a R1 million birthday party two weeks ago, where 250 guests enjoyed champagne, caviar, sushi and a spit braai at an upmarket local hotel. Yesterday, dressed in Roberto Cavalli shoes, Billionaire jeans, a Mondo jacket, Louis Vuitton sunglasses and a matching satchel, Ngcobo said his dream was to become Durban’s youngest dollar millionaire. Ngcobo denied that his firm was a pyramid scheme, and said authorities were welcome to probe his operations and business interests. Ngcobo questioned the scrutiny that has followed him over the past two weeks and said: “If a white man had thrown a party like mine, people would have been saying, ‘Oh, he comes from a good family, he’s living large’, but because it’s me, people are complaining. I’m here to make money, whether people like it or not. “There are two kinds of education in this world; there is academic education, which is guaranteed that you will always work for someone else for the rest of your life, and there is financial education, which guarantees you financial freedom. That’s what most people don’t understand. Ngcobo, who has only a matric, once worked for Toyota “carrying car doors”, before starting a debt collection company in 2006. He says he later branched into the stock market investment field and started Cash Flow Pro in 2009. Ngcobo, a father of two, said that since his birthday party, he had received overtures from women declaring their undying love for him. He denied leaping out of a giant birthday cake was a publicity gimmick similar to Kenny Kunene’s eating sushi off the bodies of semi-naked women. “Kenny can’t be my mentor; we’re not in the same fields,” said Ngcobo. Ngcobo cruises Durban streets in his white BMW M3 and in his birthplace, KwaDabeka, near New Germany, locals call him Cash Flow. “Cash must flow in abundance… I’m comfortable with my car. I can change it tomorrow and buy a Ferrari, but what for?” he said. He also laughed off reports that he owned a R2.5m house in New Germany. Ngcobo believes his business rivals were plotting his downfall by spreading rumours about him. “I’m waiting for anyone who wants to investigate. I’m here to stay. I know our concept, I know our vision. The truth will come out whether this is a pyramid scheme or a core concept. “I’d really have to be stupid to work so hard and start a company, only to start collecting people’s money and start a pyramid scheme. Ngcobo said his expensive party was money well spent – and he’d do it again. He said Cash Flow Pro had more than 1 500 members and operated by training people on how to trade on the stock market. “People have the option to link their accounts to ours. The client must open his own account, fund it, and then go to Sars to declare, because we trade offshore, and then get a tax clearance for foreign investment. “After getting it, he goes to his bank and transfers money from his account to an overseas account in the name of market.com. At no point do they put their money in Cash Flow Pro. “After linking the account to ours, the client then signs power of attorney, authorising Cash Flow Pro that whenever the client trades, the commission they get is concurrent. Ngcobo said that as far as he was aware, his company did not need to be licensed by the SA Institute of Stockbrokers, as it did not deal directly with people’s money. However, if investigators were to find anything wrong with his compliance, it would not be deliberate. Durban millionaire Jabulani Ngcobo celebrated his 26th birthday at the weekend with a party that cost a cool R1m and was attended by some of the country’s most popular celebrites, including Generations stars Winnie “Khethiwe” Modise and Sophie “Queen” Ndaba. The party was the latest in the rags-to-riches story of Ngcobo, who celebrated his birthday in style at a five-star hotel. The party continued at his posh New Germany home well into the early hours of Sunday morning. Guests enjoyed expensive delicacies like caviar, oysters and, the current favourite with South Africa’s wealthy, sushi. Entertainers included DJ Bongz, Sox, Mzokoloko and King Sifiso and performer L’vovo Derrango. Other guests included the who’s who of showbiz – bling queen Khanyi Mbau and former Generations star Dumisani Mbebe were on the guest list. Sizwe Dhlomo, who is presenter of the Live television show, and Isidingo stars Sisa Hewana and Leslie Fong were also present. The son of a poor family from Greytown, and a former fast food outlet and shop assistant, Ngcobo showed just how far he has come. Ngcobo made his millions through his stock market trading company, Cash Flow Properties, which teaches people how to trade on the stock market. Generations stars Winnie Modise and Dumisani Mbebe are ambassadors for the company, which was established in 2009. “I spent R1m on my party because I want everything I do to be top class,” he said. He matriculated in 2003 at Langa High school in Clermont and has no formal training in stock trading. Ngcobo loves cars and drives a BMW M3. He also owns a Hummer, two Mercedes-Benzes, and a BMW M6, which he said belonged to his company. His company’s website claims that people can make a 10-30% return on their investments “daily and compounding”. Ngcobo said he would not identify the college where he got his tuition because he “would be promoting it” by naming it. Ex-Generations star Dumisani Mbebe confirmed he was an ambassador of Cash Flow Properties. He said his role was to be “the face of the company”. He declined to say how much he was paid as ambassador. Cash Flow Properties’ second ambassador, Winnie Modise, could not be reached for comment.